When we enter or leave a space through a doorway, most of us rarely wonder about the evanescent consequences of doing so. Yet, without considering that doorway as a bridge between worlds, we remain unaware of subtle changes in ourselves with relation to those worlds through the nature of our experiences on either side of it. In that sense, mezuzot (plural of mezuzah), those ubiquitous little boxes (attached to doorposts of traditional Jewish homes to guard them from harm) serve as memory tools for our awareness of these transitions and of the eternal unity of G-d. This tradition has defined the Jewish people since the early Israelites marked their doorways for protection from the tenth plague* during the first Passover in Egypt over three thousand years ago. Mezuzot are made in various sizes of materials from clay to wood, metal or glass and are often beautifully crafted works of art. Marked with either the single Hebrew letter shin or with the three Hebrew letters shin, dalet, yud that represent one G-d’s holy names, the box encloses a tiny rolled parchment (klaf) inscribed by a kosher scribe (sofer*) with two verses from the Torah; Deuteronomy (Devarim) 6:4-9 and 11:13-21. These verses are written in 22 equally spaced lines, as are the verses in Torah and tefillin**. This parchment must be placed upright under the Hebrew letters in the box so that the prayer will appear correctly. When we occupy a new home, a mezuzah is installed on its doorpost. It is held in place at the upper right-hand side tilted toward the inside of the home. 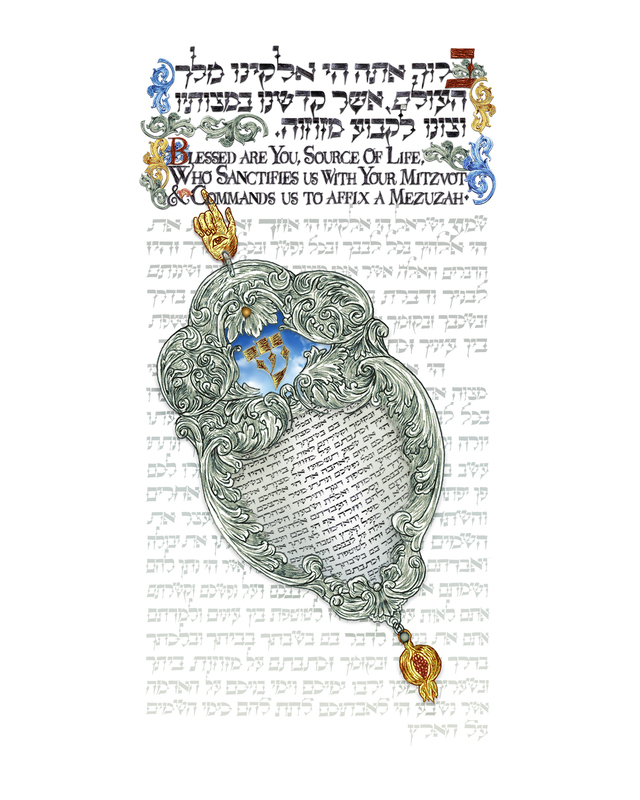 But before it is secured to the post, a special blessing is recited, as shown in the illustration above. This procedure is repeated when a mezuzah is installed at each doorway in the home except for the bathroom. Entering and leaving those spaces is then acknowledged with a touch to the mezuzah followed by a brief kiss to the hand that touched it, invoking G-d’s blessing and protection on our comings and goings. It is important to know that over time, the parchment (klaf) may become damaged and so should be periodically examined by a sofer who can repair any broken letters and preserve its effectiveness. But the protective energies of the mezuzah have not always gone unchallenged in Jewish history. 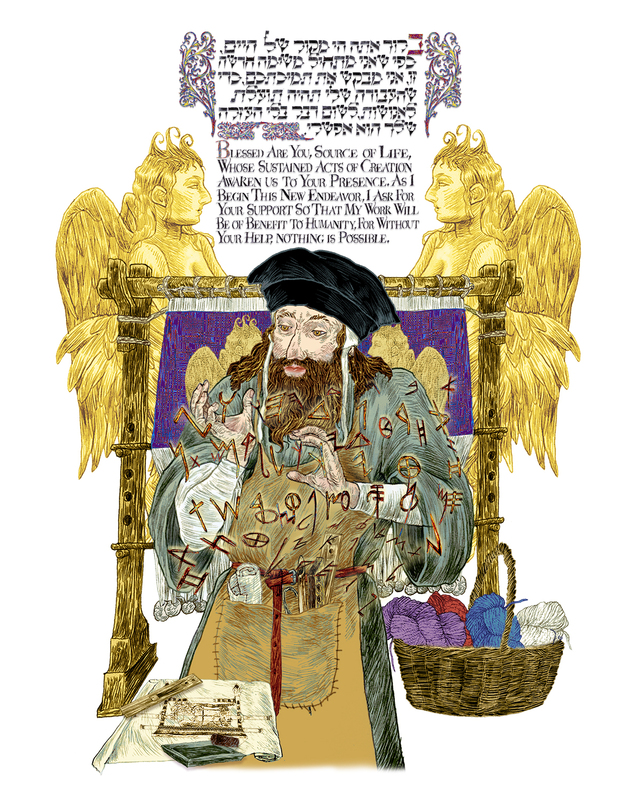 In Talmudic times, mezuzot were attributed with powers to ward off evil spirits, but by the Middle Ages, under the influence of the Kabbalah’s esoteric knowledge, names of various angels and magickal phrases (sometimes accompanied by mystical diagrams) were added to the Torah verses. This latter practice slowly lost momentum when the RamBam (an acronym for the 12th century French Rabbi and Talmudist Rabbeinu Mosheh Ben Maimon) asserted that no harm could come of writing Hebrew letters on the outside of the mezuzah case and the prescribed verses within, but those who wrote angelic names or other formulae on the inside would lose their share in The World To Come (Olam Ha-Ba). 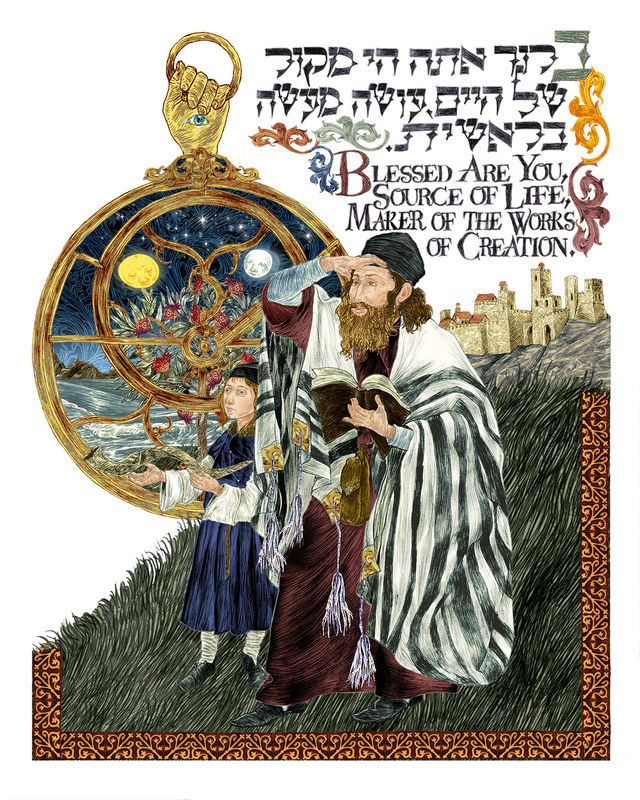 So, for this 17th entry in my book An Illumination Of Blessings, the mezuzah in my illustration displays the Hebrew letter shin on the outside and only the Torah verses on the klaf within. For clarity and artistic intent the 22 klaf verses also appear in the background. The tiny gold pomegranate suspended from the mezuzah signifies abundance and its seeds, said to number 613, represent the categories of mitzvot or the commandments we are required to fulfill. For decorative purposes only, an equally tiny hand with an apotropaic eye crowns the mezuzah. This is called a chamsa, inspired by those ancient devices employed to ward off evil throughout the Middle East. On a personal note, though I’ve always had mezuzot in my home, it was only some years ago during and after a health crisis that I thought to have them checked for damage. Indeed, the sofer informed me, several critical letters had become damaged and the klaf needed to be repaired, a pronouncement that caused chills to run down my spine.. 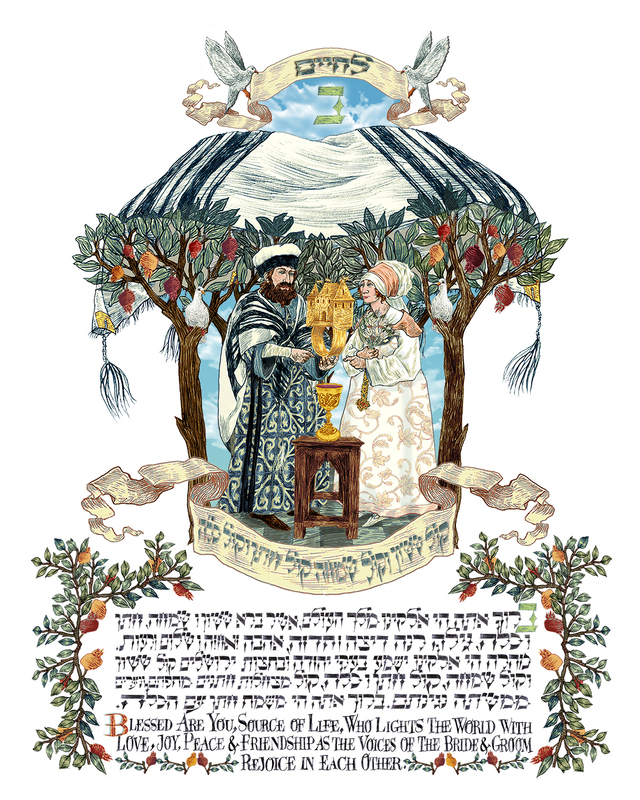 The Seven Blessings, or Sheva Brachot are a lovely old tradition, each one recited under the Chuppah (Marriage Canopy) by chosen friends and family at Jewish weddings. The Seven Blessings begin with the blessing over wine (‘pri hagofen’) followed by praise and gratitude to the Source of Life for our creation, for our existence and for our ability to thrive through time. They also address the binding of the couple, wishing them a life of love, joy, peace and friendship from the Biblical perspective; that their union should mirror the happiness of the first couple in the Garden of Eden. Finally, the couple is made aware that as they rejoice in each other, their union will also bring joy to the world . Rabbi Aryeh Kaplan suggests that Jewish weddings reflect the giving of the Torah at Mt. Sinai symbolizing the wedding of Heaven and Earth. 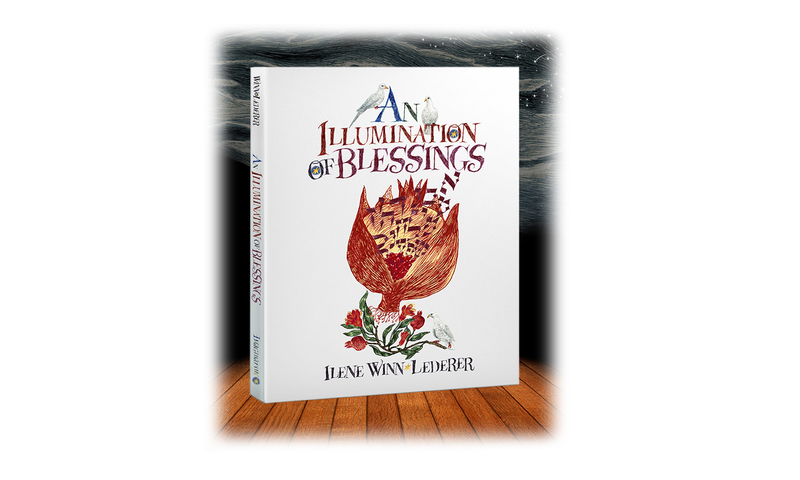 For the eleventh blessing in my book, An Illumination Of Blessings, I initially attempted to work all seven blessings into the illustration, however after further research and several iterations, I came to the conclusion that the seventh blessing really encompasses the other six and is therefore essential. 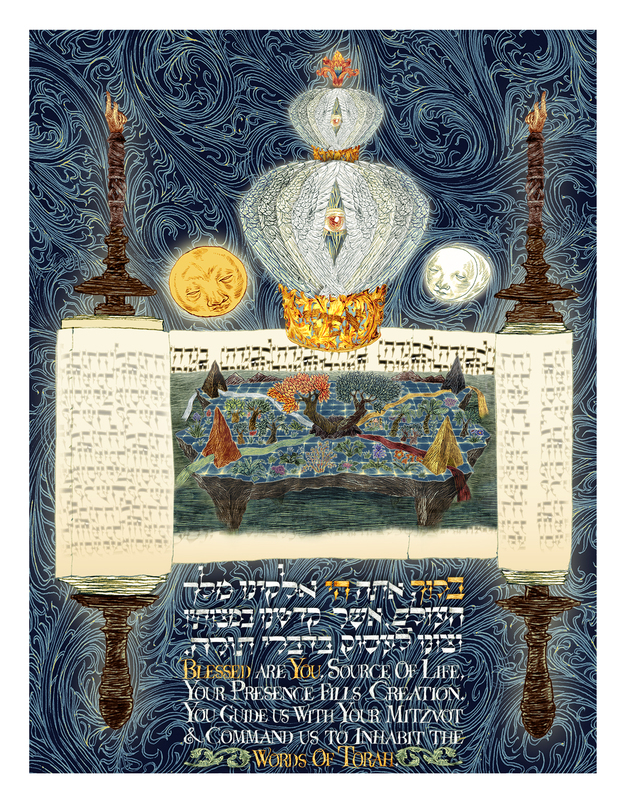 This idea was suggested by an interpretation in Kabbalah which explains how each of the seven blessings corresponds to seven of the sefirot, or the energies that are the foundation of Creation. Although there are actually ten sefirot, the interpretation posits that the three remaining sefirot do not correspond to their own blessings because two of them, Keter (Crown representing ethereal consciousness) and Chokhmah (representing Wisdom) are contained in the sefirah of Binah (Understanding) and the last one, Malkhut receives all of those above and before it. 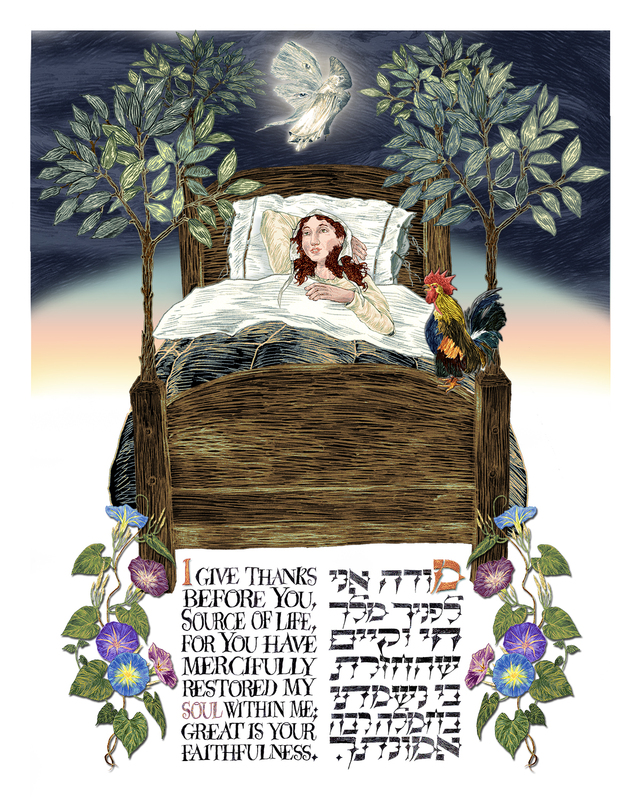 The Hebrew language in the Seventh Blessing also contains ten words or synonyms for happiness, peace and friendship, all of which lead to joy. In this sense, it corresponds to all ten sefirot as well as the ten phrases by which the world was created and the Ten Commandments given at Mt. Sinai. These ideas prompted me to place the letter Bet (for Binah) in the space above the Chuppah for these values must guide all that we do. The commentary at the end of the book will provide explanations of the symbols that appear in the illustration. 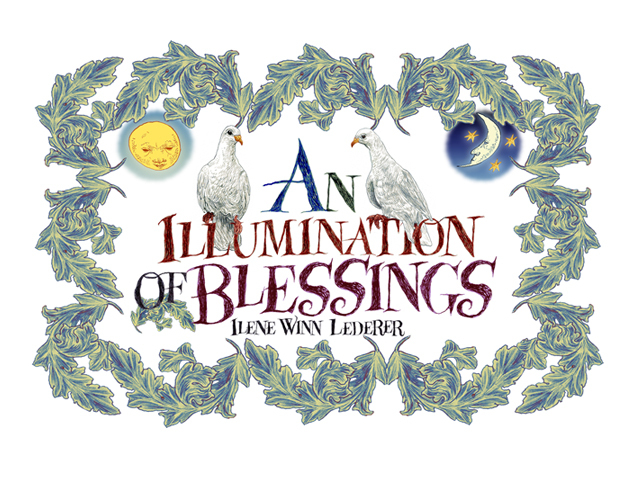 Shown above is the finished illumination for the Seven Blessings and below is one of the iterations.